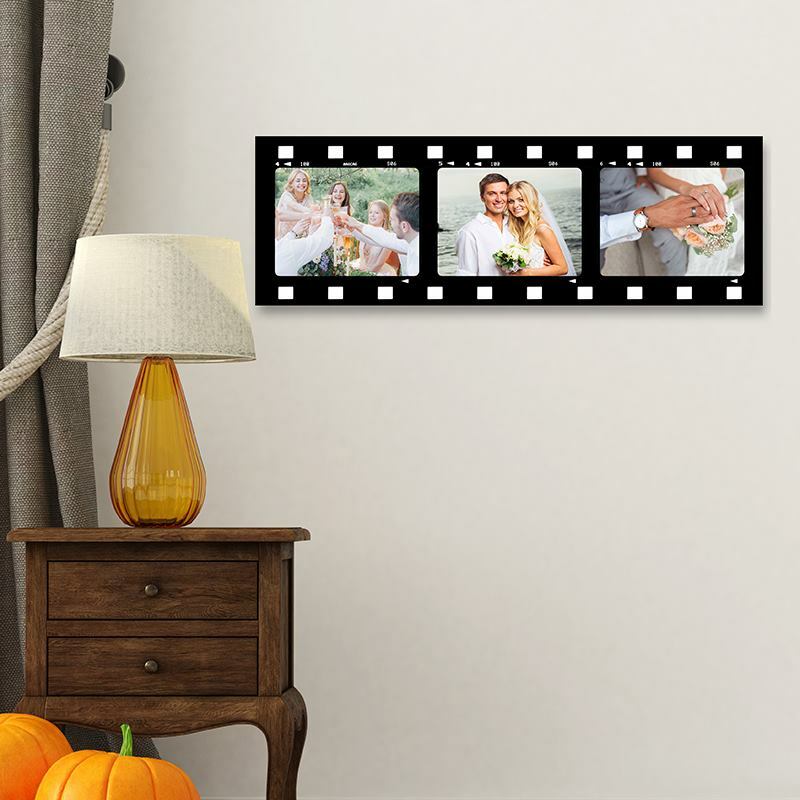 Bring Hollywood to your home and create your own canvas film strip photo frame. The film reel design is iconic and, printed with your personal photos, it really brings drama and star quality to any room. Our retro cinema style collages can have two to seven aperture frames, each containing your special photo or design. This is the perfect way to capture a memorable life event and bring it to life, cinema style. You can choose between two to five or seven images to create your movie filmstrip collage. The depth of the canvas is 2.5cm apart from the largest size, which has a depth of 4.5 cm. Landscape photos work best, as each photo area has a ratio of 4:3. Portrait photos can still be used but you’ll need to position them manually. Create a whole movie canvas trilogy with our 3 for 2 offer. Simply design one, add to the basket, then go back to design another, add to basket and repeat! You photos are printed directly onto strong and durable canvas using eco-friendly, fade-resistant inks. The print is permanent and cannot peel or rub off. You canvas print is then mounted and framed in the iconic design. Everything is made to order in our facility using the highest quality materials, so we can always ensure an incredible print. Mark your greatest achievements with a film strip photo frame. Capture classic graduation shots like everyone throwing their mortar board hats into the air, holding your degree scroll and posing with Mum and Dad. Handy Tip: You can choose 2, 3, 4, 5, or 7 images to create your movie filmstrip collage. The depth of the canvas is 2.5cm apart from the largest size, which has a depth of 4.5cm. Landscape photos work best, as each photo area has a ratio of 4:3. Portrait photos can still be used but you’ll need to position them manually. Create your own poster prints on fade resistant, 160gsm satin paper. A4 or A3 in either landscape or portrait orientation.